Rising to this challenge requires an understanding of how demographic and technological trends are impacting each of the Four Points of the Main Street Approach, Main Street America’s adaptable revitalization framework. These Four Points—Organization, Design, Economic Vitality and Promotion—provide a path toward revitalizing our community through a well-organized and cohesive strategy. For this discussion, we are looking specifically at how a dramatic advance in technology has impacted the way we promote our communities and tell our Main Street story. that showcases a community’s unique characteristics. Technological and other changes have had a tremendous impact on the way we get around and especially on how we shop today. In fact, the impact of online shopping has played a role in the demise of enclosed shopping malls and put tremendous pressure on big box retailers. But the way we promote our Main Street has been equally impacted, if not more so. That is because the single greatest technological change of the past decade is the way in which we access and consume information. Just a few years ago we saw a major milestone and shift in the way we search for information on the internet, and that trend has continued to accelerate. According to Google, in 2015 mobile searches surpassed desktop searches for the first time. Although smartphones have been around almost 20 years, the release of the iPhone in 2007 and the meteoric rise of Android phones have seen the rapid progression of smart mobile devices. Simply stated, we now rely on our phones more than ever before and their increased computing power, along with advances in artificial intelligence, quite literally place information in the palm of our hand. And while we have never met them personally, today we should care very much about what Cortana, Siri, OK Google and Alexa have to say about us. So what does that have to do with my Main Street? OMG, everything! People are no longer sitting at home searching for information on your community—they are on their way or already there! 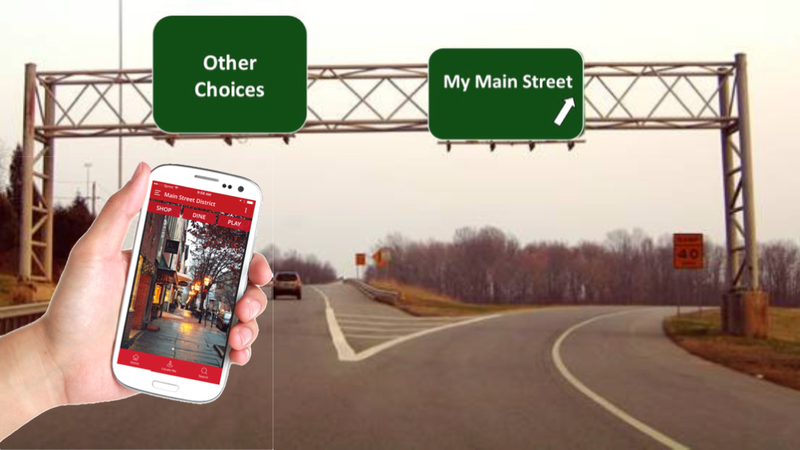 Today promoting your Main Street requires a comprehensive mobile marketing strategy. What are you doing to ensure that information on your Main Street—a map showing where to park, information on local attractions, details on your events, a directory of your amazing local businesses—that all of this information is easily available to visitors as they arrive? How will today’s huge mobile audience know all of the wonderful things going on in your Main Street? As with the reality of search engine optimization for website search results, all of that is happening now on mobile devices. In fact, today Google’s search algorithm is now based on the completeness and accessibility of your Main Street website’s mobile friendly version. So what does all this mean and what can we, as Main Street directors, do about it? Our challenge is both obvious and daunting. If we do a great job of creating interesting and engaging events but can’t reach the mobile audience most wanting to hear about them and attend, we have missed a huge opportunity. It’s like the old saying: What if you threw a party and nobody came? While that’s certainly an exaggeration for our Main Street events, we know that reaching a broader audience is essential in making sure our hard work really pays off, and reaching a broader mobile audience is sure to increase attendance and word of mouth. First, check to verify that your Main Street website is truly mobile friendly. Google recommends this simple test. For your Main Street’s website and social media pages, review your content carefully with a focus on the audience you are trying to reach. Search rankings rely on relevant content so that mobile users can easily find exactly what they are looking for. If your website’s home page is focused more on the fact that you are a 501c3 and follow a Four-Point approach, will visitors to your site know what that means? How will they know what your community is really all about and why they should visit? “Come on, honey – let’s check to see what 501c3s we should visit this weekend.” That doesn’t mean you should not include this information somewhere in your About section, just not the focus of your home page story. Imagining yourself as a prospective Main Street visitor, try some common searches to see how you fare in search rankings. If you’re not in the first one or two results—sorry, you don’t exist! Seek help on search engine optimization (SEO), with a focus on mobile users. Try searching on a desktop or laptop computer, and also on your phone. You may not have a smart assistant like an Amazon Echo, but you should find someone who does, and see what Alexa has to say about your Main Street. Then do the same for Siri, Cortana and OK Google. Google refers to a micro-moment as “an intent-rich moment when a person turns to a device to act on a need—to know, go, do or buy. In these moments, consumers want what they want, when they want it—and they’re drawn to brands that deliver on their needs.” Searches resulting from these micro-moments will either drive traffic to your Main Street or result in missed opportunities. Google recommends that we anticipate the micro-moments of prospective Main Street visitors by being there to provide precisely the right information when those moments occur. Whatever mobile apps and websites your visitors are most likely to use must include your content. Our experience has been that some communities make the mistake of trying to create their own mobile app, only to realize that the people most likely to download it are the only ones on the planet who don’t need it: your local residents. To reach a broader audience, you need to belong to networks that support all Main Street communities with one app that includes all districts. For Main Street communities, the audience we are most trying to reach has a world of information in the palm of their hand. Does that information include your Main Street? Dr. Ron Cook is CEO and co-founder of distrx, a mobile marketing platform and application designed exclusively for Main Streets, with headquarters recently relocated to historic downtown Sanford, Florida. A graduate of Georgia Tech, Cook is a recognized expert in beacon technology and frequent presenter on the “internet of things”. A former college Dean, he is a popular and dynamic speaker on innovation, entrepreneurship and launching a new business.